The Targus APM32US Laptop Travel Charger with USB Fast Charging Port easily powers or charges a laptop and a tablet/smartphone simultaneously while at home or on the road. It includes a USB fast charging port 2.1A that connects right to end of the cable for rapid charging. 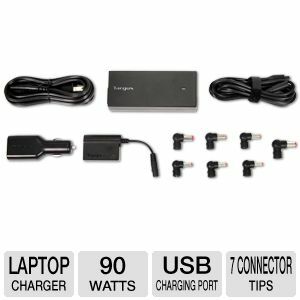 With built-in surge protection, this Targus APM32US Laptop Travel Charger is ideal for travel and includes 7 laptop tips to support Acer, Asus, Compaq, Dell, Fujitsu, Gateway, HP, IBM, Lenovo, Panasonic, Sony and Toshiba and one USB port for iPad, iPad 2, leading tablet devices, the iPhone, Blackberry, and other devices with USB charging capability. To charge multiple devices in the car, just plug in the portable auto adapter in the vehicle cigarette lighter socket and off you go.